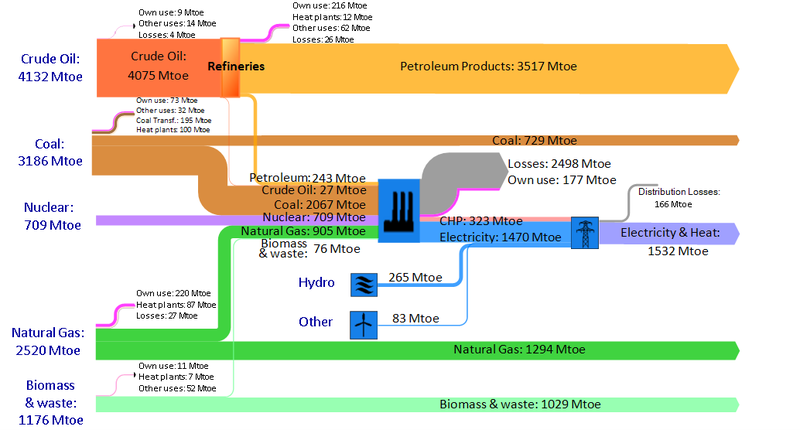 This Sankey diagram visualizing the energy balance for the French island Réunion has already been published back in 2010 in an article on reliability of supply in future power systems. (Mathilde Drouineau, Nadia Maïzi, Vincent Mazauric, Edi Assoumou. Long term planning tools and reliability needs: focusing on the Reunion Island. 3rd IAEE Rio 2010 International Conference “The Future of Energy: Global Challenges, Diverse Solutions”, Jun 2010, Rio de Janeiro, Brazil. 14 p., 2010). Access article here. The flows are in Mtoe for the year 2007. The authors have been using the Markal/TIMES models to obtain data and study alternatives for future energy scenarios for the Réunion Island.